MOSCOW (Sputnik) - Venezuela is not satisfied with its quota for oil production under the Vienna agreement of the Organization of the Petroleum Exporting Countries (OPEC) and non-OPEC producers and is currently taking measures needed to restore its level of oil production, Venezuelan Ambassador to Russia Carlos Rafael Faria Tortosa told Sputnik. Washington depends on Venezuela's oil and will be unable to stop importing oil from the country right away without first finding another source, Venezuelan Ambassador to Russia Carlos Tortosa told Sputnik. "The issue of introducing sanctions targeting oil trade is yet another act against us. They [the United States] have not done that yet because the United States is dependent on our oil. They will not be able to cease oil imports in a single day. They will have to find another supplier," Tortosa said. Washington has repeatedly stated that new sanctions could be imposed on Caracas, specifically targeting the country's oil industry. In May, Washington banned US citizens and legal bodies from engaging in transactions with debts and equities related to Caracas or to state-owned oil and natural gas company PDVSA. The Venezuelan Ambassador to Russia wend on saying that the US sanctions against Venezuela in the oil field if imposed, will not affect the country's cooperation with Russia. "We believe that no [influence on Caracas-Moscow relations will take place]. We think that our policy of cooperation between the two countries is very independent and immune to any US sanctions… We, in particular, seek to continue this cooperation with Russia, our friend and ally, in the oil field," the ambassador stressed. He also expressed hope that the work of the Russia-Venezuela high-level intergovernmental commission would enhance the existing cooperation between the two countries. Earlier in the week, Washington pledged to take several steps to increase its pressure on the Venezuelan government. The United States has stated on numerous occasions that it does not rule out the imposition of new sanctions against the country, in particular, in the oil industry. The United States has long been opposing policies of Venezuelan President Nicolas Maduro and has introduced numerous sanctions against Caracas to counter them. "The oil production has dropped indeed, we disagree with Venezuela's quota as part of the OPEC-Non-OPEC deal," Venezuela's ambassador to Russia said, while noting that on the other hand "concrete steps" aimed at the restoration of the nation's "capability to produce oil are being taken now." According to Carlos Rafael Faria Tortosa, during Venezuelan President Nicolas Maduro's visit to China, a very important issue was discussed relating to financial assistance for Venezuela's oil production. "It will help us to return to the oil production levels set by the [Vienna] agreement of December 2016. Our quota, which we have agreed on, remains the same, but in reality, we do not meet it. 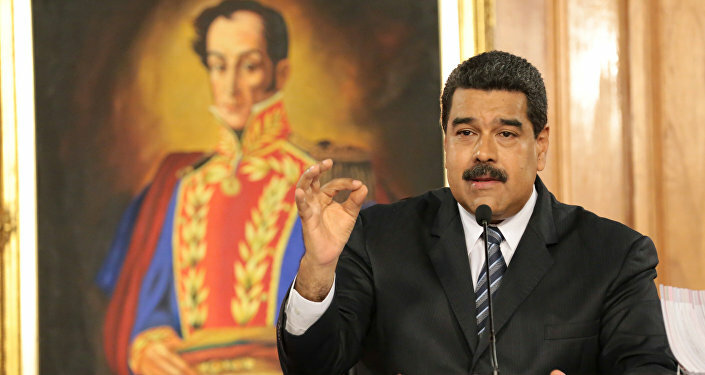 But Maduro already has a concrete plan to restore oil production levels," the diplomat stated. The political crisis in the country has been complicated by the economic situation being affected by a global drop in oil prices and US sanctions imposed after Washington blocked US investors from buying Venezuelan debt. The issue of possible establishment of a Russian military base in Venezuela has not been considered so far, Venezuelan Ambassador in Russia Carlos Rafael Faria Tortosa stated. "It has not been discussed so far," the ambassador said when asked if the possibility of setting up a Russian military base in Venezuela was examined in the light of the recent statements by representatives of the United States and the Organization of American States (OAS) on possible foreign military intervention in Venezuela. According to the diplomat, the intergovernmental commission is likely to meet in late October — early November. The last meeting of the Russian-Venezuelan intergovernmental commission was held in the Venezuelan capital of Caracas in April.